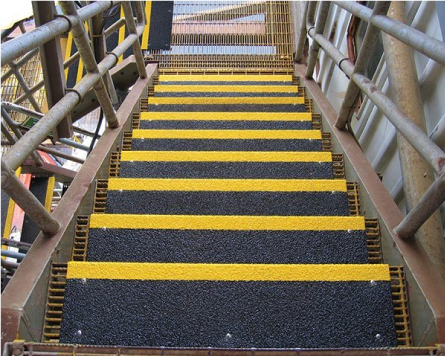 To complement the StairSAFE® range, CoverSAFE® is offered to provide seamless anti-slip protection for stair landings. CoverSAFE® encompasses any exposed areas including landing areas and leading edges. CoverSAFE® allows the combination of a large flat area with a vertical lip with a consistent finish and coverage for any landing. 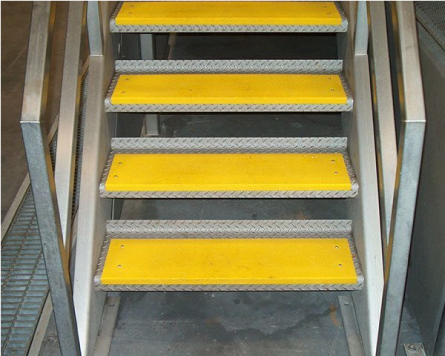 Glow in the dark covers are available for after hours, low light environments and emergency situations on top of the standard contrasting colours on the edge step to make it more visible. CoverSAFE® has kept many public and institutional buildings, like hospitals, nursing homes and public transportation facilities, safe. Our covers take into account the size of a walkway with the wrap of a step cover to provide maximum protection to the leading edge.